· Archeological sites able to yield information. 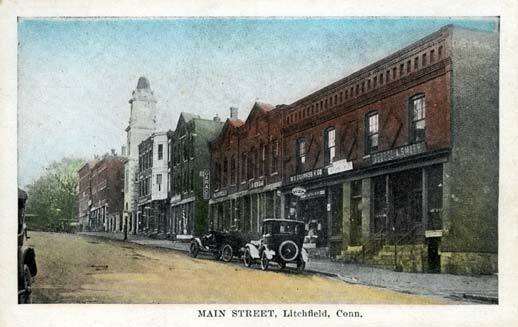 In the application for designation as a National Historic Landmark in 1967, Charles W. Snell wrote that “Litchfield is probably New England’s finest surviving example of a typical late 18th century New England town.” He especially tied the district’s significance to the fifteen frame houses from the late 1700s and the three from the period 1800-1828 that still stood in the center of town. Snell further established that several of these houses were designed by William Sprat, a British architect turned soldier who was captured at Saratoga and who, as a prisoner of war, was brought to Connecticut. He remained in the state after the war, renewing his architectural career. Sprat was well known for his Late Georgian style, typified in Litchfield by the Julius Deming house and the Sheldon Tavern. The Litchfield Historic District is defined by the National Park Service as including the east and west sides of North and South Streets to the rear property line, running from Prospect Street on the north to Gallows Lane on the south. It also includes the building fronting the northeast side of the green, those structures from the Congregational Church to North Street. In total, the district comprises about 20 acres. Architectural features were not the only feature of the town that impressed the National Park Service, who in their designation noted “the great elms which now form a broad and beautiful archway over North and South street.” Thanks in part to this designation, 21st century residents and visitors see parts of Litchfield through in much the same way as those who lived here two hundred years ago. This entry was posted in History, Uncategorized and tagged Litchfield, Litchfield Green, Litchfield Historic District, National Historic Landmark by pvermily. Bookmark the permalink.